From K. L. Nasir, "A History of the United Presbyterian Church of Pakistan," in "Christian Beacon," October 10, 1968. "The church has found that it must contend not only with political upheaval and nationalistic religion but also with division in its own ranks" -- so the United Presbyterian Church in the U.S.A.'s Commission on Ecumenical Mission and Relations wrote in 1967 about the state of Presbyterianism in Pakistan. Fifty years on, we glance back at the fractious period in the life of the Synod of the United Presbyterian Church of Pakistan, culminating in an assembly riot. In 1967, the United Presbyterian Church of Pakistan and the Lahore Church Council counted membership of 70,000 -- some 10 percent of all Pakistani Christians. Their congregations operated in strong headwinds: following the 1965 war between India and Pakistan, many Christians living in border areas were arrested by the Pakistani government on suspicion of having pro-India sympathies. While for many their detentions were brief, the roundups sent a shock through the Synod. It duly began to prepare plans for greater consolidation, and a focus on strengthening the lives and livelihoods of Pakistani Christians. Being Presbyterian, this manifested in a dispute over administration of mission work. Would hospitals, schools, and seminaries be subject to the Synod, or would they be governed by autonomous boards, each with a seat reserved for the Synod? Concern about state authority and disputes about the centralization of church government would soon be channeled through a dispute over the Confession of 1967 . Between 1965 and 1967, members of the Synod, among them K. L. Nasir, a teacher at Gujranwala Theological Seminary, had attended the UPCUSA General Assemblies that prepared the Confession, and they had come away adherents of Carl McIntire, habitual protester  outside these GAs. A faction of Gujranwala faculty, believing the Confession was unorthodox, boycotted a June 1967 called-meeting of the Synod, and gathered that July, styling themselves the General Assembly. In R. Park Johnson's account, the Nasir General Assembly took no actions, it was "in actuality no more than a party caucus. It was not followed up in any way in practice." The dispute swiftly spread, to the extent that church sessions were divided against each other. The Nasir group spent the next year suing the Synod in thirteen different jurisdictions, seeking to block various Synod actions. On February 8, an ad hoc committee of the Synod brought the various combatants together to agree on procedures for electing commissioners to the 1968 assembly, and to impel K. L. Nasir and his colleague Nazir Yusuf to drop their suits. A month of relative calm followed, and Synod set April 1 to assemble at the Presbyterian school in Pasrur. 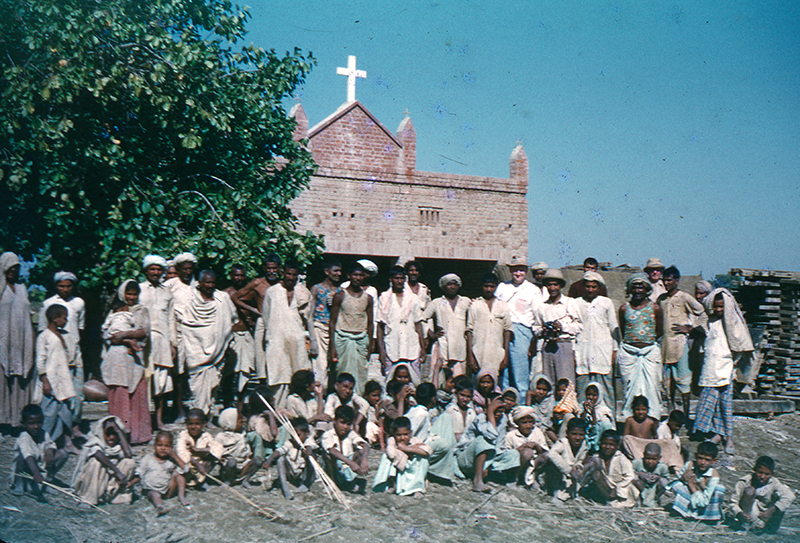 Village church, Pakistan, before 1966. From Gail Asel papers, accession number 92-0303. The roll call began over "continued vociferous objections" of members of the Nasir party sitting in the front row. The confrontation escalated as a group of men, some of them not commissioners to the assembly, gathered in the main aisle and stood, shouting and elbowing each other. The secretary, Piyara Lall, continued to call roll when, according to Johnson, "fists began to fly, the Secretary was manhandled, chairs were thrown back and forth across the aisle [...] Panic ensued, as most of the delegates fled from the auditorium, scrambling over and upsetting chairs and benches in their flight." After a 10 minute interruption, three-fourths of the gathering returned to their seats. Nasir's faction withdrew to the lawn behind the auditorium. The Synod would ultimately excommunicate nine ringleaders of the violence, and recommend that Nasir and Yusuf be removed from their posts at Gujranwala. That August, Carl McIntire's Independent Board for Presbyterian Foreign Missions would send Ara Euredjian as a missionary to Pakistan. McIntire himself would visit in September for the opening of Faith Theological Seminary. Yusuf's and Nasir's factions would later split with each other. Nasir's group continues as the United Presbyterian Church of Pakistan. The Synod of the United Presbyterian Church of Pakistan would merge with the Lahore Christian Council in 1992, creating the Presbyterian Church of Pakistan, a mission partner of the PC(USA) and member of the World Council of Churches. The Battle of Pasrur is just one among the scores of stories contained in a tranche of India-Pakistan records that PHS opened to researchers late last year, described as Record Group 500 . Stay tuned for more, including a tale about the illustrious water buffalo, Beejwallah , of the Allahabad Agricultural Institute.